Inventory fluctuates and item may be in stock, otherwise would typically ship in 5 – 7 days. To place an order, check real time inventory status and lead time, call us today! The 1ST1G9A4 Goulds Pump NPE 316L Stainless Steel G&L Centrifugal – 1 x 1-1/4 – 6, 2 HP, 3500 RPM, 60 hz, 208-230/460 Volt, 3 PH, TEFC Motor, 6 1/8″ Impeller, Viton Seal, 1 1/4″ NPT Suction, 1″ NPT Discharge. Our Company is an authorized Goulds Distributor. 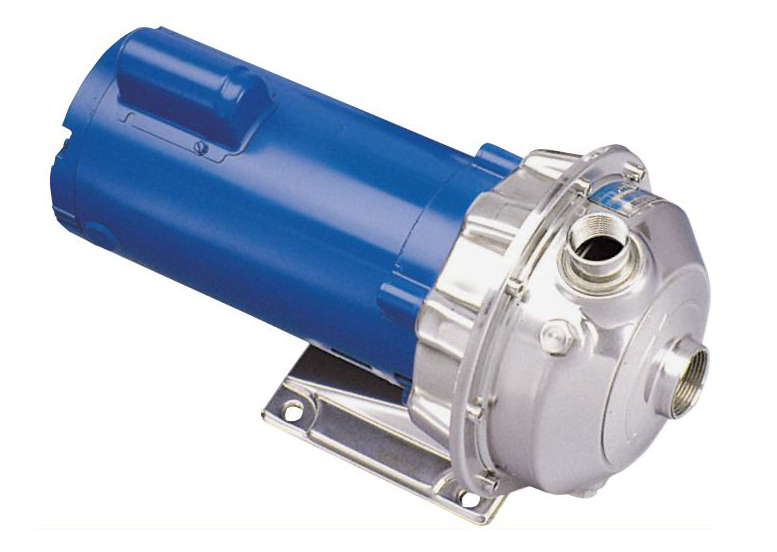 Pumps Purchased from us come complete with manufacturer warranty. The close coupled compact, flexible design saves space, can be mounted horizontally or vertically, and simplifies maintenance. Standard NEMA motors are open drip-proof, totally enclosed fan-cooled or explosion proof enclosure, have stainless steel shaft, and are designed for continuous duty under all conditions with single and three phase available. Superior, complete AISI 316L stainless steel liquid handling components for corrosion resistance and improved strength and durability. Casing and adapter have NPT threaded center line connections, easily accessible vent, prime and drain connections with stainless plugs. Unique floating O-ring enclosed impeller design maintains maximum efficiency. Standard John Crane mechanical seal of silicon carbide, viton and stainless metal parts with optional high temperature and chemical duty seals available. Goulds Pump NPE Series is designed for the following applications: Water Circulation, Booster Services, Liquid Transfer, Spray Systems, Chillers, Washing & Cleaning Systems, Injection Molding Cooling, Reverse Osmosis, Air Scrubbers, Heat Exchangers, Filtration Systems, Jockey Pumps, OEM Applications and General Water Services. NEMA standard open drip-proof, totally enclosed fan cooled or explosion proof enclosures. Rugged ball bearing design for continuous duty under all operating conditions. Superior Materials of Construction: Complete AISI 316L stainless steel liquid handling components and mounting bracket for corrosion resistance, quality appearance, and improved strength and ductility. High Efficiency Impeller: Enclosed impeller with unique floating seal ring design maintains maximum efficiency over the life of the pump without adjustment. Type the Text You See Above in the Box Below.